We provide an honest and fair service for landlords. We don’t inflate prices on repairs and maintenance; our fees are transparent and excellent value. We harvest the best tenants and ensure thorough referencing. The benchmark we set is ‘would we rent our own property to this tenant?' Creating secure and good quality tenancies from the start lead to landlords and tenants coming back to Urban Village again and again, so it’s in everyone’s interest to spend the time and effort generating quality and value. We promote a ‘clear charges policy’ to all landlords and tenants, setting out our marketing strategy and offering from the start. 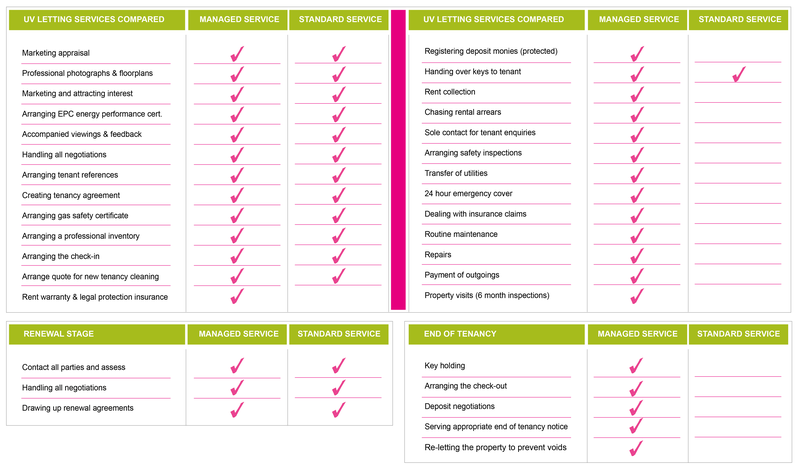 We have a flexible range of letting services to suit your individual circumstance and budget. We listen and act upon your instruction. 10% including VAT for our standard 12 month tenancy. No automatic renewal fees charged! 12.5% including VAT for our standard 12 month tenancy. No automatic renewal fees charged! 15% including VAT for our standard 12 month tenancy. No automatic renewal fees charged! We also add FREE RENTAL WARRANTY and LEGAL PROTECTION COVER for rent collection and managed landlords.